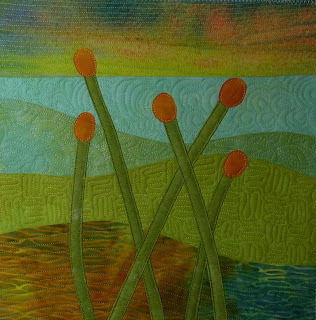 This small piece is for SAQA's 20Th Anniversary Trunk show, "Meet SAQA's Artists". It will travel for a year and then a portion of the small works will be selected to become a part of an international quilt study at the University of Nebraska-Lincoln. For the trunk show, I decided to make another one in my "Pods" series and it is named "Pods III". The piece had to be less than 11" square to fit in an 8" sq. mat. Pods III is 9 1/2" square, so not all of it will be visible in the frame. The work was to be a good representation of my work as an artist. 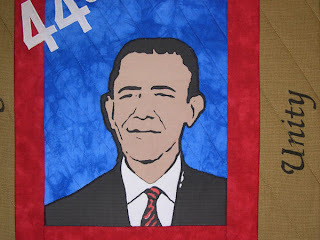 I thought this was a good way to show my favorite part which is machine quilting. I used my hand dyed fabrics and also commercial fabrics (got to keep those quilt shops going). 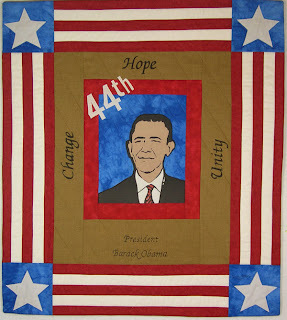 Here is one of the quilts I have been working on. I made it Andy Warhol style using Photoshop Elements. It is now at the college and the exhibit details are below. I saw Mr. Obama on TV giving a speech and took a snapshot with my Casio Z77. I turned it into a sketch and added details. Then, I printed it on fabric. Good thing the college is taking professional photos, mine did not turn out too good...the colors are off a bit. Guess I need more practice on taking quilt pics. historic moment in our country's history.